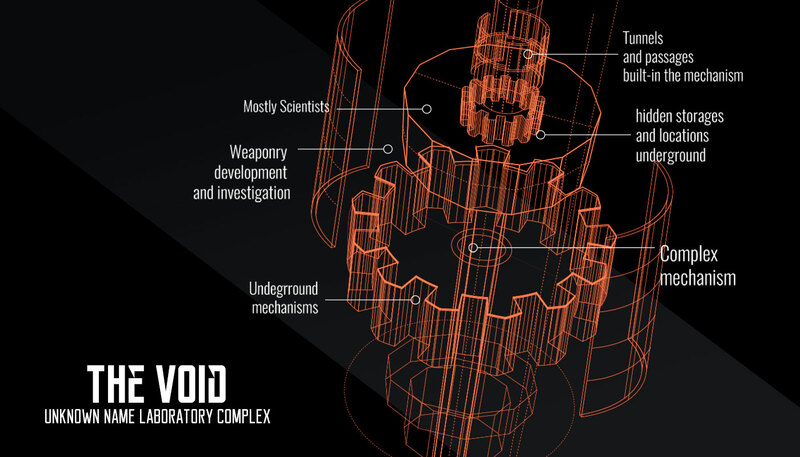 The Void was built as a souterrain laboratory facility, many years ago. Many are unaware of its existence and it isn’t clear why the complex ended up abandoned, but the most accepted theory says it had to be evacuated due to several experiments out of control. The place turned very dangerous and The Consortium decided to abandon it and erase most records of its existence, leaving hundreds of valuable and unconcluded experiments locked inside. Just recently some of the complex gates have been located, and The Consortium is trying to reuse or recover valuable investigations lost years ago in the interior. Failed Xeno are sent to die inside the complex, but the real reason behind of this is unknown. There are still many places yet to explore and almost anything is possible to be found inside, there are even small settlements of Xeno that aren’t trying to escape anymore and have decided to stay and try to survive. The Void is so massive that it feels it has no exit, the tunnels shift and reconfigure from time to time with no explanation, and the only clear thing so far is that inside this place there’s only danger due to the broken mechanisms and forgotten experiments. It is the bigger and safer zone inside the complex, where most supplies can be found. it's rumoured that a huge pit exist at the middle of it, and that some Xeno try to populate the area around it. 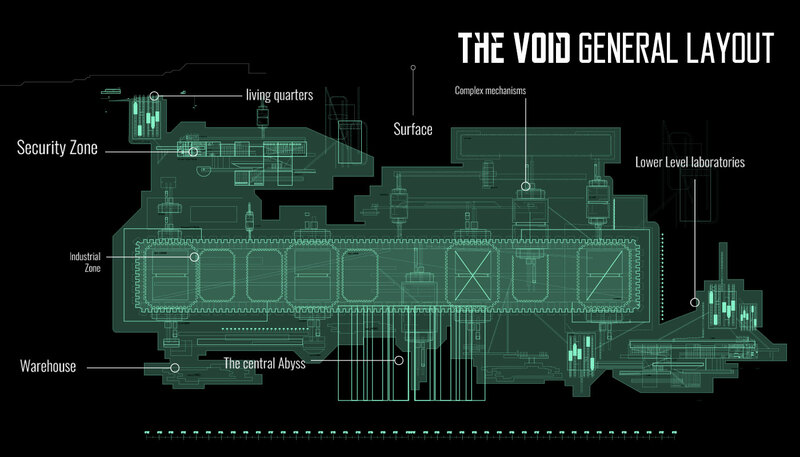 The Void has several zones the Xeno have managed to figure out. It's the section closest to the surface, the word that better describe this area is "danger", despite being the smallest portion of The Void, it's the most dangerous to explore and try to inhabit, mainly because the rooms and hallways are secured with many movement, sound and infrared sensors, cameras with a better view of every place where security robots guard the hidden secrets. This sector has the max security measures, as it was strategically placed as an entry point to maintain intruders away from the inner installations. It's good to not risk going inside this sector, as many turrets are hidden inside the ceilings, walls and floors to repel intruders. It's equally easy to find yourself in front of a security robot patrolling hallways or protecting valuable assets. Small drone robots called Prime Catchers are also found here, moving in small groups in search of unwanted Xeno wandering the area. The rooms in this sector usually look quiet and peaceful, serving as a trap for wandering, unsuspected individuals. Above the security zone the worker and scientist rooms are located. Here you can find more proof of that this complex used to be used by humans, as they came here to rest and spend their free time. Today this sector is one of the less accessible, as it's entrance it's blocked by the security zone. The rooms of this place are different and the habitat areas have many floor levels, structurally divided by wide and angular hallways. The whole sector is modular. In these room several useful and valuable objects can be found, as people stored their belongings or left their information logs in their work computers. Sealed and almost unexplored due their ultra safe security codes and robot guards, which are the most terrible menace for the ones who desire to enter these weapon deposits to obtain their hidden treasures. In these lockers and storages it is common to find F.O.E uniforms and armors, some even only contain heavy weaponry and armor. There's always need for Xeno gear, and these creatures are very versatile: they can pick small armor parts and integrate them to their usual equipment. The bigger and more inhabited portion of The Void as it is a relatively the safer place. Many tunnels and a huge and deep pit goes through its many levels. It's a sector full of machinery, warehouses and laboratories, as it was the main work place for humans and the location of many assembly lines for different types of artefacts. 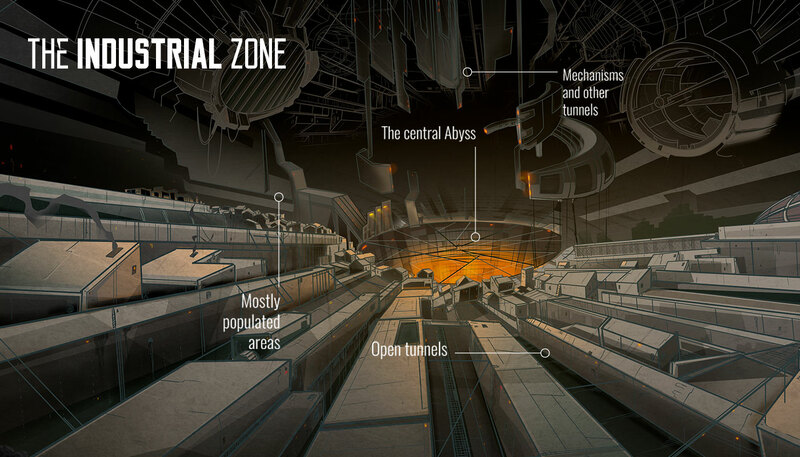 Mostly part of the Industrial Zone, the pit goes through the center of The Void, it's big and with an uncertain depth. Warm gas comes from it, and sometimes even strong lights or fire; it's crossed by many platforms and conveyor lines that until this day bring random parts and machinery pieces across the whole Industrial Zone. The laboratories located deep into the facility are the most dangerous, since here top secret experiments where carried out; little is know about this sector as it is difficult to explore. Key for the survival of Xenos inside The Void, these deposits of valuable resources are distributed across every sector, and having a deposit nearby is key to populate areas of The Void.